"Somebody said to me last month that they’re ‘Vichy Republicans,’ which I didn’t fully understand," Cordray said. "I guess that’s ‘Vichy France' during World War II, the ones who went over and collaborated with the Nazis." Cordray's campaign spokesman Mike Gwin told the Enquirer that Cordray regrets the Nazi comparison. "Rich believes Ohioans deserve elected representatives who will stand up for what's right, even if that means speaking out against people of their own party," Gwin said. "He regrets repeating someone else's inappropriate comparison in making that point." 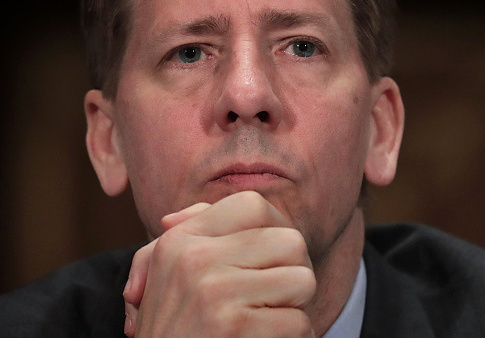 Cordray, the former director Consumer Financial Protection Bureau, first assumed the post under former President Barack Obama, He remained director at the beginning of the Trump administration but resigned shortly before he announced his candidacy for governor. Cordray easily won the Democratic nomination in the primary and has received support from national Democrats, including Sen. Elizabeth Warren (D., Mass. ), who was one of the main legislators behind the CFPB's creation and campaigned for Cordray in April. Cordray and his running mate, former Rep. Betty Sutton, will face Ohio Attorney General Mike DeWine, a former senator, and Secretary of State Jon Husted in the general election. This entry was posted in Politics and tagged 2018 Election, Governor, Ohio, Richard Cordray. Bookmark the permalink.